Hey, Friends!! 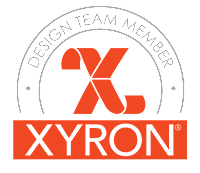 I'm back again with Team Xyron today!! And brrrrr... It's cold outside!! It's not even Thanksgiving and temperatures have begun to dip. I'm hoping that Mother Nature makes up her mind. I mean, it is still technically fall, right?! Supposedly we still have 37 more days of fall to go... say what?!! Yup, that's right, winter doesn't officially begin until December 21!! I don't know about your neck of the woods, but in my area, the frigid air here screams WINTER!! So what is one to do... 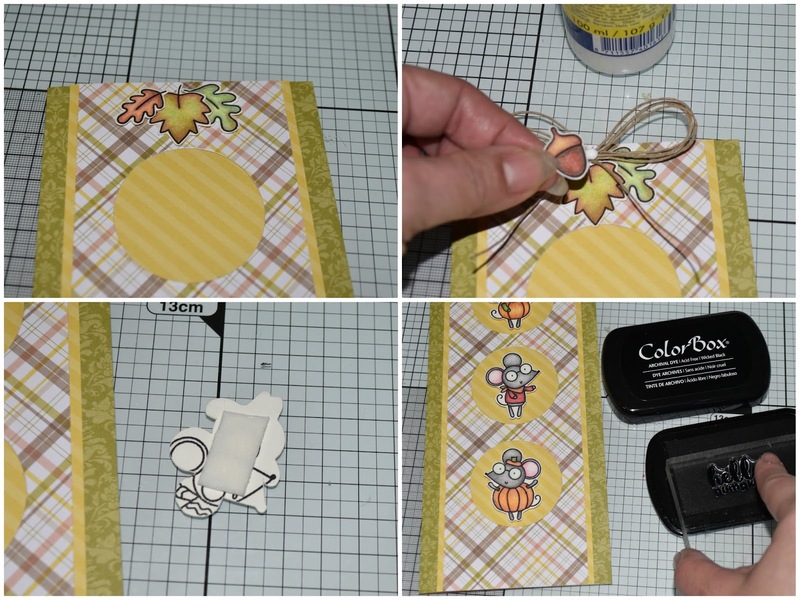 Craft for Fall or craft for Winter?? 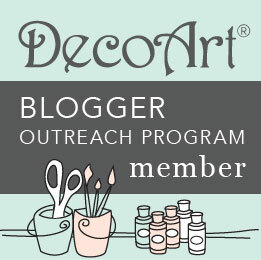 Well, if you're ever stuck in that sort of dilemma, let me give you a tip, buy products that are dual or multi-purpose! 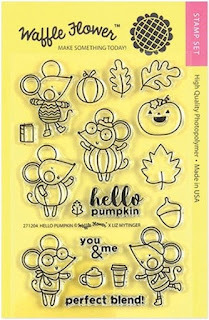 Like this set from Waffle Flower called Hello Pumpkin. 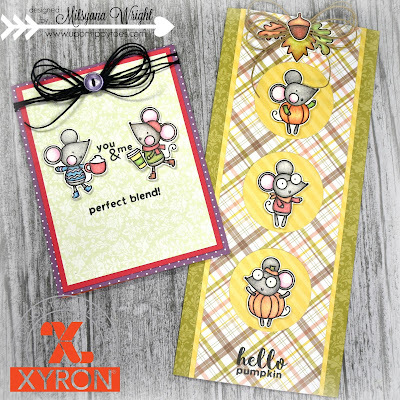 This set can be used throughout your year-end holiday seasons. 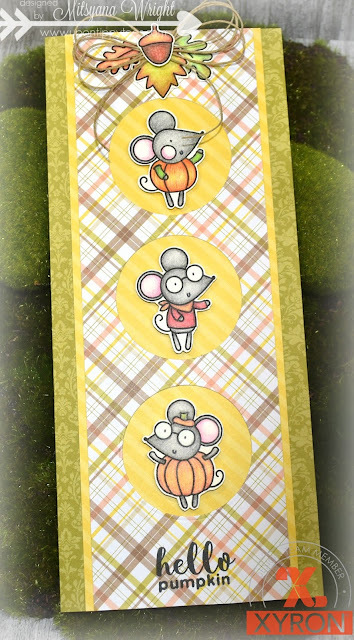 It's filled with jack-o-lanterns, pumpkins, and sweater wearing mice!! And did I mention the cute latte and coffee/ cocoa accessories? You can literally use this set to craft from Halloween to Christmas just with this one set! But since Halloween has already passed, I'll show you how I created these winter and fall cards below. I started by using my Misti Stamping Tool to stamp my images from Waffle Flower's Hello Pumpkin onto a piece of watercolor cardstock with ColorBox Wicked Black Dye Ink. I colored all the stamped images in using Derwent's Procolour Pencils. The watercolor paper is quite textured and it has a nice tooth for the pigments in the pencils to grab onto. The trick with these pencils is to have a light hand. Apply gentle pressure and work in layers. If you apply too much pressure you burnish the color down and rid the paper of its tooth so the paper can no longer grip anymore color. Here's a trick to change seasons... switch out your color palette! Yes, it's that simple. With the exception of stamps that are obviously specific to a certain holiday or event, simply changing the color palette can result in a different feel and theme. For example, I colored some images in oranges, greens, and browns (fall colors), while others were blues and purple (cool winter tones) or greens and reds (traditional Christmas colors). 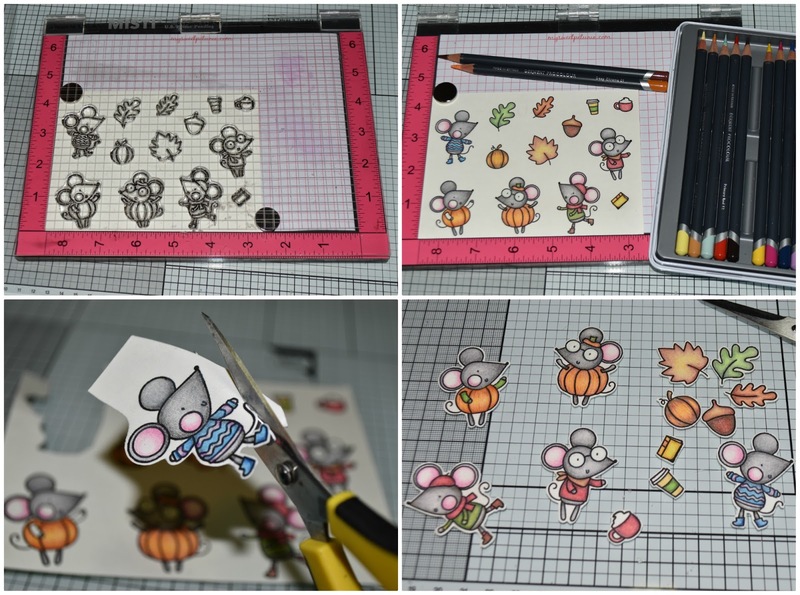 Once I was done coloring I cut my little munchkins out by hand. The matching set of dies is available for this set but I find hand cutting images relaxing so I don't mind the fussy cutting. Coloring images can help set the mood and determine theme but so can paper!! Paper is, in my opinion, the biggest & easiest way to change the feel of your project. These shades make up the palette of my Fall card. And all my patterned paper came from one paper stack... DCWV's Fall Basics Stack. I cut the card base to 9 1/4"x 8" and folded it in half (9 1/4"x 4" -folded). The yellow striped mat measures 9 1/4"x 3 1/4". 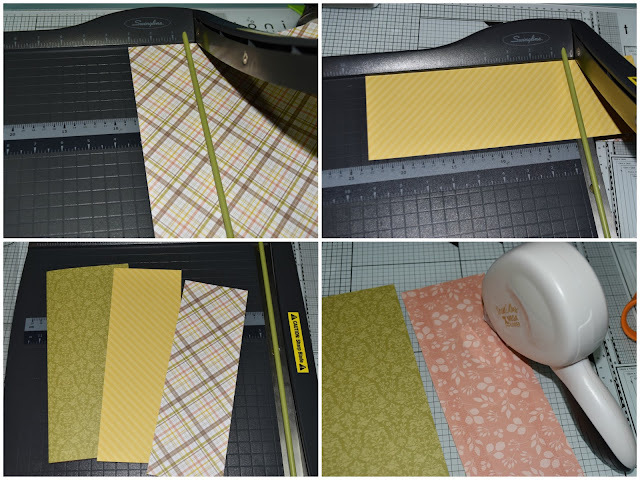 And the plaid paper measures at 9 1/4" x 3". I used my Mega Runner to adhere the first mat to the base. Adhering the piece straight down the center of the card. 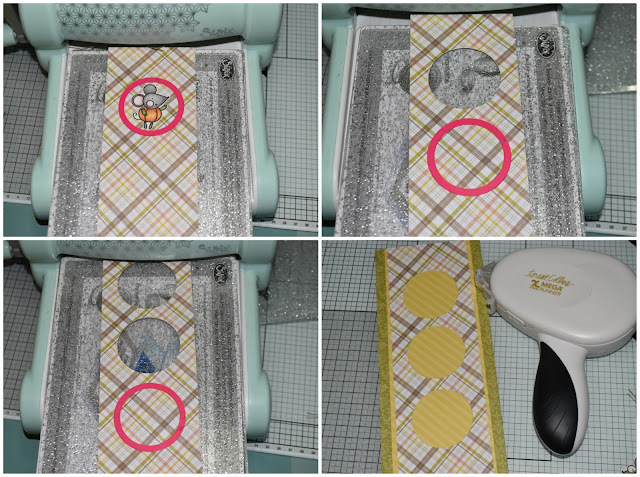 I used my Big Shot with the magnetic platform and a circle die to cut 3 windows down the center of the mat. Then again, used my Mega Runner to adhere to the yellow striped paper. I attached the leaves at the top center of my card. Then attached a small twine bow over top. Then, I topped off the bow with an acorn center. I added foam adhesive to the back of my critters to give them a little dimension and placed them each into a window. Then to finish this card, I simply stamped the sentiment "Hello Pumpkin" in black ink. Look how adorable it is! So simpl and oh so cute!! Then, I created this easy A2 (4 1/4"x 5 1/2") sized card base matted it twice giving each mat a difference of 1/4"
Mat #1- 4" x 5 1/4"
Mat #2- 3 3/4" x 5"
Layered and attached them with my Mega Runner. 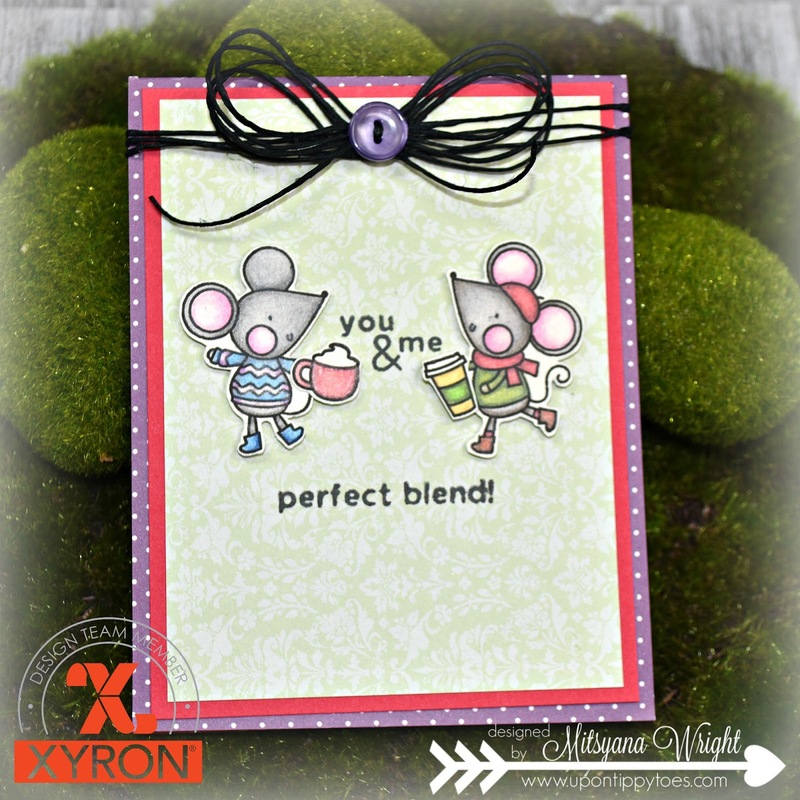 Stamped the "You & me" sentiment towards the center of the card. Then added my "dimensional" mice (one on each side of the sentiment). I almost forgot to give them their little beverages... I love how this set comes with the little latte and cup of hot cocoa (it can also double as coffee for all you coffee lovers)!! 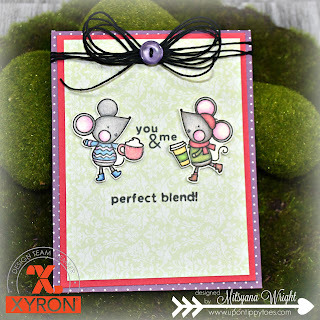 Then, finally added my bow and stamped the words "perfect blend" underneath the little mice. EEEEKKK!! Yup, I'm squealing like a little mouse! These are just too flipping cute! I'll be definitely getting tons of use from this set for sure! Well, I hope you enjoyed today's double feature!